We have been using standard languages and methodologies for ASIC/FPGA design and Verification activities. We as an engineer must know on history of verification activities. Today we mostly work on verification standard languages like System Verilog. The whole industry is moving to accept this language with few methodologies (RVM, VMM, AVM, OVM, UVM etc...) as their standards for new and existing product development and verification. Now since we use the industry standard languages like VHLD, Verilog, and System Verilog, we must know and understand history and importance of Verification languages. Let’s understand how we reached to a System Verilog usage? What are the other different verification languages engineers were using in past few decades? How did they start their usage from Verilog to System Verilog for verification? Let’s go back to history and understand these questions. When Verilog first developed in mid-80, main requirement and usage of this language was to develop synthesizable RTL with not much complexity. Revolution started by late 1980s. By late 80s synthesis and simulation triggered a revolution for EDA industry. As time passed, In 90s industry realized a tremendous need to solve complex verification problems due to complex designs. This was the time when EDA Company played a key role in filling the requirement to solve this verification issues. Those days verification languages which become popular and people started using those were proprietary to some companies! Best examples are ‘Open Vera’ and ‘e’ language. Since these languages were proprietary to EDA companies, some people were using the Object Oriented Languages like C++. During those days some users were using Verilog to develop their testbench, looks interesting, Isn’t it! The problems gets started during 1990s when Verilog become an industry standard. In 1980s a company called Gateway Design Automation developed a logic simulator called Verilog-XL and Cadence acquired in 1989 with right. Now with a new strategy Cadence put the language in to the public domain with the intention that Verilog should become a standard. After this Verilog HDL is now maintained by Accellera a nonprofit making organization. In 1995 Verilog HDL became IEEE standard. Accellera came up with revised versions in 2001 and then in 2005 and industry taking this as standard and moved ahead. Accellera have also developed a new standard called ‘System Verilog’ which extends Verilog with newly added many feature with the concept of Object Oriented Programing. 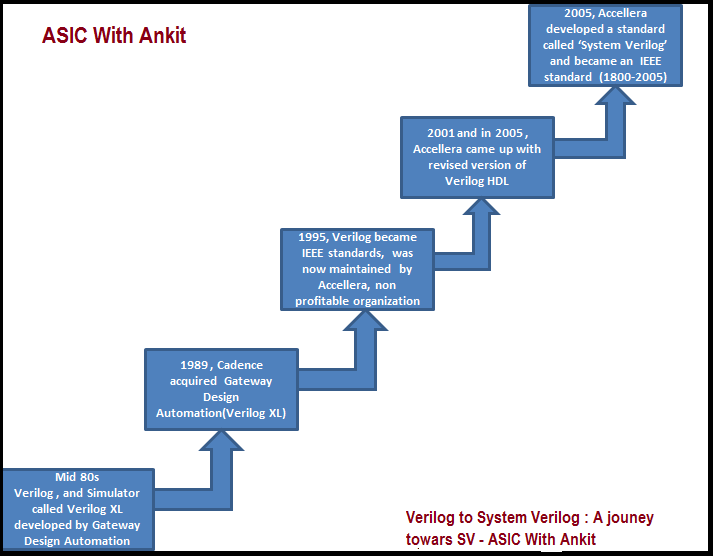 System Verilog then became an IEEE standard (1800-2005) in 2005. System Verilog is a super set of Verilog plus all the features known to be necessary for traditional verification. System Verilog is being used mostly in Verification activities because of higher level abstraction and user friendly features. Today System Verilog is already became a standard for Verification activities and most of the companies have started accepting his beauty! In addition to System Verilog usage and acceptance people have come up with few methodologies like (RVM, VMM, AVM, OVM, UVM etc…) With the addition of this type of methodologies Verification environments are becoming easy to handle, user friendly and most importantly the environments are becoming re-usable!